Mig Greengard, recently named Chess Journalist of the Year by the Chess Journalists of America, speaks his mind on the upcoming World Championship in Mexico City, Garry Kasparov and Russian politics, and why he has suggested his epitaph read : "He lowered the bar for chess journalism." In the photograph to the left, Mig temporarily captured the 2000 Kramnik-Kasparov World Championship, which was left en prise. Mig's interviewer, Jonathan Hilton, also won 2007 CJA Honorable Mention for his "How Wojo Won" series. Access full list of CJA awards here. Jonathan Hilton (JH): Congratulations! The Chess Journalists of America named you Chess Journalist of the Year. Tell me Mig, how long have you been involved in chess journalism now? Mig Greengard (MG): There's probably a long, rambling discourse that needs to be inserted somewhere about what I really consider the word "journalism" to mean in the old, professional "Woodward and Bernstein" sense for which I have a great deal of respect. There are vast, vast differences between that and what I do. When I worked for KasparovChess.com I did have a brief phase in which I was actually going places and reporting things, but now I don't consider myself a journalist so much as a columnist. I actually first started writing about chess on the "Usenet" back in the 80's, in the days before the word "Internet" was common currency. Although the World Wide Web certainly existed, for us it was all about what were called "news groups" on the Usenet, which were divided by category. So essentially you had "rec.games.chess", which was split further to "rec.games.chess.analysis.miscellaneous.computers" that sort of thing. I started experimenting with goofiness and humor and posted some tongue-in-cheek analysis of a game. Mark Crowther, editor of The Week in Chess, put it up on his site, and it got this sort of wild, long reaction, some positive and some negative. So I said well, hey, if you want more of those, I'll send you more of them. It'll be fun! That's sort of how it got started. Again, though, journalism is definitely not the term for that. I'm just writing for myself and to entertain my readers, and so that's why I consider myself a columnist. JH: You mentioned getting a mixed reaction from your audience after you wrote your first article. Do you still get mixed reactions very often? MG: Well, certainly! The nice thing about blogs today, however, is that you have instant feedback. That way if I make a joke people don't like, or say something ridiculous, by the next day I'll have twenty comments saying what an idiot I am. But that's great, because what I'm seeking to do is to empower chess fans. JH: How do you empower chess fans? By letting them know, "Hey, you can do this too!" Too often chess magazines and publications try to remain "elitist" -- they are here, you are there, and they are presenting the news to you so that you may humbly partake. I want to put the tools back in the hands of the fans. Not the editors, not the players -- the fans. The fans deserve good writing, good humor, and good entertainment to go along with scores and results and all the basics. People are hungry for something different from "by professionals for professionals", and what I am doing is showing them that they can have that. The message is catching on: nowadays it seems everyone is a blogger. That's why I half-jokingly say I'm trying to lower the bar for chess journalism -- I want to bring it back down from being an exclusive realm and really popularize it. JH: "Lowering the bar for chess journalism" -- that would make an interesting slogan! MG: I was actually considering putting it on my tombstone as an epitaph. JH: Unfortunately I fear you haven't lowered the bar quite enough yet! 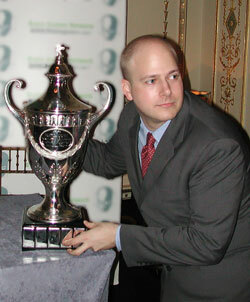 I doubt I will be nominated to receive the Chess Journalist of the Year Award this year. Tell me about winning this award! Did you do something special this year or was it just a long time in coming? MG: Haha, well, (1), thank you very much, and (2), yes, it is very nice to be acknowledged by the Chess Journalists of America. They're lovely people, I have met and worked with many of them. I want to be clear that I am grateful before I say anything about the award that might be considered disparaging. I'm not really a fan of the "awards culture". This one in particular is very odd because it's not directly about a piece of work. It's kind of like the guy who gets the "Honorary Career Oscar", which basically means "because we never actually gave you one for anything you did, and you turned out to be a really good actor and we're embarrassed about it, we're going to give you this" Now I don't mean I should have gotten a bunch of other stuff -- I'm not actually even a member of the CJA and have never submitted anything. Still, any organization wishing to promote chess through awards should focus on choosing certain pieces of work and holding them up as an example for others to emulate. There are so many different categories and so many different awards that it dilutes the value of getting an award. What the CJA needs to be doing is focusing on pieces that push chess in the direction we want it to go and then rewarding the authors who write them. JH: One thing I do find is that you have a very refreshing approach to writing about chess. In fact, I noticed on your blog you have a link to your email that says "send fresh dirt to Mig!" What I'd like to know is, why exactly did you name your website "The Daily Dirt Chess Blog"? MG: It was absolutely just an off-the-top-of-my-head sort of thing. It was the same thing when I started ChessNinja.com. I had to mentally wage a battle between ChessNinja and ChessMonkey, and after five minutes ChessNinja won out, and not particularly because of any love I have for ninjas. I'm sure I could have thought of something "chessier", but I'm sure we would all be grateful to go many more lifetimes without having to hear another corny chess pun. The logos for chessninja.com, and for the blog section of his website, The Daily Dirt." JH: Now my understanding is that you've been a part of many important business plans in chess, such as when you were editor-in-chief for KasparovChess.com. The question everyone wants to have answered is: what's the best way to turn a buck off chess? Where do you see the future of chess enterprise? MG: There's no magical road to riches -- many smart people have lost money trying to turn a buck off chess. I do know, however, that the only way to make money is to give players what they want. The big players -- ICC and Chessbase -- are slowly but surely providing the kind of robust content like audio and video commentary fans desire! Still, it seems chess is always off the curve. We're a conservative game without money to gamble on experiments. It's often hard for advertisers and sponsors to know if they're getting their money's worth. They need a profit motive. However, we're never going to be a stadium sport selling millions of dollars in merchandise a year, so an avenue we need to explore is to fund chess through public donations. Public radio and museums are funded this way, and chess has a cultural aspect that cannot be ignored. During the recent US Championship, there was a shortage of prize funds, so I decided to start asking for donations on my blog. I was shocked by the response! Thousands of dollars poured in from individual donors who sometimes gave as little as five dollars. We started giving out the "Daily Dirt" brilliancy prize. The fans loved it, and so did the players. The problem today is that it seems sponsors are almost at odds with fans -- they're always trying to make them buy something, even game scores. That lasted about a day and a half. If money is needed for a tournament, why not just ask for money from the fans? If every member of the USCF donated one dollar to the championship, we would have far money than we raised through private sponsorship. The truth is, chess fans want to give back. They just need an outlet to do so! "Ask not what chess can do for you, but what you can do for it" is a serious thing to say. JH: How does chess journalism fit into your daily life? Do you write in the "Daily Dirt" every day? MG: I have a full-time job working for Garry Kasparov, so as for the blog, I only write when something moves me. And when I write, people post comments. Essentially I'm an aggregator -- I start a conversation and people add their ideas, research, opinions and expertise. I have to thank my readers for their comments, because they are the ones making my blog interesting. That's the "power of dirt" -- people coming together as chess fans. My blog can serve as an avenue for people to unite so that their voices make an impact. FIDE has responded directly to some of our comments! This is the power of free speech and democracy in action. We've had our share of run-ins. Famously, during the US Championship this year, we clashed with the company Monroi. This got political and touchy because Monroi was helping sponsor the championship. There were some very simple criticisms of their coverage on my blog, some by me, some by my readers, such as, "I couldn't get into the website today!" -- and the people at Monroi became very aggressive rather than helpful. Some of their people wrote in and kept denying that there was anything wrong rather than inquiring further into the problem. As anyone who has spent any time on the Internet knows, when people complain on the Internet their speech tends to not be very polite or nuanced, and that's life. And if some fool in Kalamazoo decides to give your book only one star on Amazon.com even though he's only read the back cover flap, there's nothing you can do about it. Monroi getting combative and saying nothing was their fault was a stick right in the hornet's nest! JH: Godwin's Law states, "As an Internet discussion grows longer, the probability of a comparison involving Hitler approaches one." Did things go that far downhill? MG: It did take a turn for the worst. That's exactly it: every online shouting match tends to eventually lead to someone calling someone else a Nazi, I'm sure that was brought up at some point. But it got to the point where they actually threatened legal action. They said, if you don't delete the comments that you and these people made, we'll sue you. They kept going on about liability. I couldn't believe it! Don't they know what that does to an online community? Before long everyone's turning into a flag-loving, first-amendment-hugging patriot! Rally around the wagons! JH: While we're on the topic of the First Amendment, tell me some about your involvement with Kasparov and Russian politics. I hear there have been civil rights violations in that country? MG: Well, as you know, Garry retired from chess in 2005 after winning Linares. He thought he had achieved as much as he could in chess, and as he saw Putin's increasingly authoritarian regime crack down on the media and civil rights, he decided he needed to be involved full-time in Russian politics. My job is to help him, in particular with his writing, something which I can do from here in the safety of my home in Brooklyn, New York. Mig Greengard and Garry Kasparov, hard at work. JH: What does Kasparov do? MG: He did a book on how life imitates chess, and he gives speeches to businesses. He travels a circuit in Europe giving lectures. He contributes to the Wall Street Journal and is the moderator of a coalition called "The Other Russia", which is a coalition seeking true democracy in Russia. The idea is to use his stature as a famous chess player to bring people of all different political ideologies together to unite against Putin. Often we're criticized for associating with political parties that sound spooky or have radical ideas and bad political track records, but the point we make is that as long as there is no democracy to allow the spread of ideas, none of our current differences matter. JH: So few people in this country realize the atrocities taking place in Russia because our media focuses on our nation's own problems. We did see it in the headlines when Kasparov was hit over the head with a chess board in an assassination attempt, but many of us don't understand what the circumstances are in Russia today. MG: Well, we're not just about making Putin into some boogeyman. This is really about the whole system he represents. If he decides not to try to hold on to his power during the election next year, it isn't as if the person he appoints as his successor is going to be magically enlightened or anything. It is this increasingly irrational environment he has created that is the problem. This time last year a journalist named Anna Politkovskaya was gunned down in cold blood in an apartment building. One of our own [that is, from Kasparov's party] journalists, Larisa Arap, was just released a few days ago after being held against her will in a "psychiatric hospital" for forty-six days. It was insane. They gave her medications and claimed that she couldn't see her family because she was a "danger to herself". Every day there are court cases ruling against free speech and free assembly, but it is only when something high-profile such as an arrest of Kasparov happens that something will make the news. Even then it can't stay in the news -- we're talking about a slow, steady trend, and editors want something more splashy for headlines. My satisfaction comes from the little successes -- perhaps we make some news and a politician here in the U.S. comments on it. When that sort of thing happens I know we're getting the word out. JH: Is Kasparov in grave danger? MG: One of Kasparov's biggest assets is his stature and fame. Putin can't just arrest him and imprison him without suffering repercussions. However, the ordinary guy protesting with Kasparov out in the streets is always in danger. One of the gravest threats is the "extremism" law, which states that stating anything considered extremist is illegal. Kasparov was detained by the KGB for three or four hours of questioning because of something he said on the radio. Can you imagine that? JH: Your involvement fighting for democracy resonates with your efforts to empower chess fans at a grassroots level. At the risk of sounding corny, what are some other parallels you've drawn between chess and politics? MG: When Kasparov is asked that question, his answer is that in politics you can change the rules. Any day now, Putin could declare "The Other Russia" an illegal extremist group and force it to disband immediately. In chess the rules are stable, but Putin could force a rule change at any time. JH: Is Kasparov going to run for President of Russia in the upcoming elections? MG: That is for him to say, not me! I cannot make a statement for him. If his party "The Other Russia" nominates him as the best candidate, he will have to either accept or decline, but he believes there may be many candidates more qualified than himself to run. Remember, although we think of him as old for a chessplayer -- he's forty-four -- he's young for a politician. JH: Will we be seeing much of Kasparov in the United States? MG: He and I are finished a streamlined version of his latest book, already published in Europe and Asia, for the United States business audience. "How Life Imitates Chess" comes out here in October and he'll be touring on the East Coast. He's going to be on 60 Minutes then and he'll also appear on the Colbert Report in October. We'll release the full schedule of signings and appearances soon. JH: I'm a huge fan of Steve Colbert! I will certainly be watching. MG: Yes, you actually get more accurate news on the Daily Show and the Colbert Report than you do with the regular news. JH: Switching topics a little, what are your impressions of the upcoming World Championship in Mexico City? MG: I'm a traditionalist and would love to see a match rather than a tournament. However, it seems to me that this tournament is actually just a qualifier! Kramnik has the right to challenge the winner of this tournament, so he's actually playing in his own qualifier and has loss-odds. Topalov's deal is even better -- he lost the match to Kramnik and has the same benefits without having to play in the tournament. FIDE keeps changing the rules, and this makes it hard for it to generate respectability. They're banking on the fact they're the only game in town, but perhaps Bessel Kok can clean the town up. As for favorites, Kramnik is still the World Champion. He may hardly be dynamic enough to win a tournament like this, but if +3 is enough to win the tournament, he has a good shot. If something insane -- such as Topalov's +6 -- is needed to win, Anand will be the player to watch. All the others are secondary, but Morozevich is also capable of a winning streak if he can avoid losing a ton of games. JH: Finally, to wrap things up, I want to ask you about your experience with Chess.fm online chess radio. You have been a co-host with the likes of Gregory Kaidanov, Joel Benjamin, Larry Christiansen, and John Federowicz. What have you learned from these great players, and what advice do you have for me as I co-host the radio show for the US Chess League with FM Robby Adamson each Wednesday? Jonathan Hilton trying on his headset, in preparation for chess.fm coverage of the www.uschessleague.com. MG: It has been absolutely instructive to work with so many great players! The one thing I continue to learn more and more is that at the GM level there are many things that go on that are very nuanced and difficult to explain to an audience. Not that GM chess is completely inaccessible, but rather that I have learned very well how much I still do not know. My advice to you for your show: be generous! Set your co-host up to look good. Never be afraid to ask questions. Always sound confident -- if you are not confident, your audience senses it. They don't mind if you are not a strong player -- ICC could easily have hired two Grandmasters rather than hiring me -- but they want you to be entertaining, and to make good conversation. Don't feel ashamed to put yourself in a chess student's shoes and ask your co-host about a naive-looking move. This isn't being archived for the Library of Congress -- so speak up, have no fear, and just go for it. The two worst things you can do are to just say "um" and to have dead air time. JH: Thank you so much for your time and for the interview! MG: My pleasure. I'll look forward to hearing you on the air.